Some of them may call it “A Guided Tour” and some may call it “Found a Friend in Bhuj” or Some may call it a “Handicraft Village Experience” Whatever you may name it but for me it’s all the Same. My Love and Passion for my region and my people that I am sharing with visitors, will be the same. Day 1: Local sightseeing tour in Bhuj to learn more about the local communities, bit of history of Kutch. Later visit some arts and craft villages around Bhuj. Spending evening in nature and overnight stay in Bhuj. 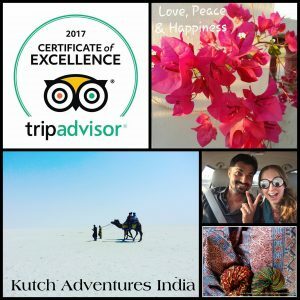 Day 2: Explore the Great Rann of Kutch and visit some local villages and communities who are known for their extraordinary lifestyle, handicrafts and culture. Sunset in the Great Rann of Kutch and overnight stay in Mud Hut/Village. Day 3: Drive up to the top of Kalo Dungar Hills overlooking the Great Rann and also visit the potter and block printers on the way back. Some random stops to meet herders or capture photographs on the way. Stay overnight in Bhuj. Day 4: Day trip to Mandvi to enjoy the beautiful Mandvi Beach, visit the wooden ship building yard and take a walk in narrow streets of town while admiring local communities busy with their daily shopping. Drive back to Bhuj by evening. Programme- Visiting local monuments, narrow streets full of local communities and visiting handicrafts being made by artisans. What's Excluded-accommodation, food & beverages and entry fees in monuments.